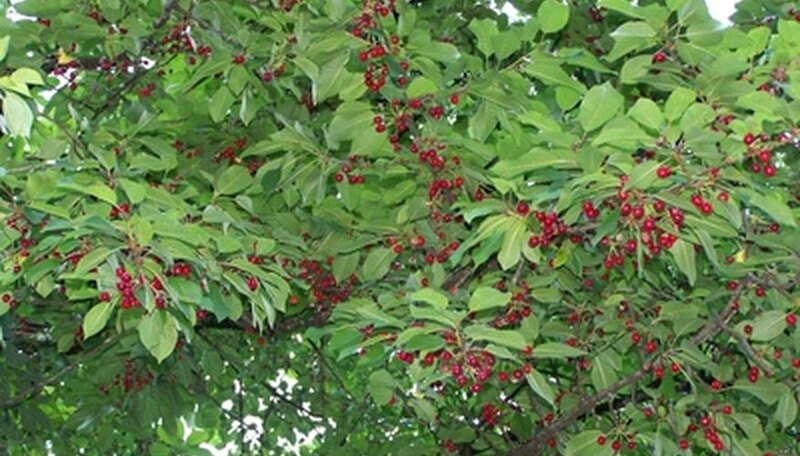 Gardeners with fruit trees are fortunate to enjoy two benefits from their fruit-bearing trees. Not only do these trees serve an ornamental purpose with their colorful blossoms in the spring season, but the trees also provide delicious fruit harvests in the summer or autumn. Tart cherry trees grow energetically in full sun and will self-pollinate to produce a bountiful cherry harvest if you can get to them before the birds. Harvest sour cherries to use in pies, cobblers and compotes. Assess the cherry tree regularly beginning in mid-summer so you will notice when the cherries are ready for harvest. When the tart cherries are full size, as large as a jumbo marble, deep red, juicy and somewhat soft, they are ready for harvest. Set up the stepladder beneath the cherry tree to reach the cherries, if necessary. Climb the ladder with the bucket in your hand to pick the cherries. Pick the cherries by hand with the stems intact for cherries that will keep longer. Pick every cherry from the tree that is ripe and collect the cherries in the bucket. Place the cherries into plastic sealing bags and store them in the refrigerator. Do not wash the cherries until you are ready to use them. Use the refrigerated cherries within two days or they may begin to deteriorate and spoil. Return to the trees every day or every other day to pick cherries until there are no more cherries left to harvest. Tart cherries mature earlier than sweet cherries. If you cannot use the fresh cherries within two days, freeze the cherries. Wash and pit the cherries. Place 1 qt. of cherries in a medium-size bowl and add between ½-cup and ¾-cup of granulated sugar to the cherries. Stir the cherries and the sugar together to mix the ingredients well and pack the cherries into pint-size containers. Leave 1 inch of empty space at the top of each container and seal the containers tightly. Label the containers and freeze them for as long as one year.